Ernst Stelzer was a scientific group leader in EMBL’s Cell Biology and Biophysics Unit at Heidelberg for almost 28 years and is now a CEF-investigator in the DFG-funded Frankfurt Institute for Molecular Life Sciences (FMLS) as well as a Professor at the Goethe University in Frankfurt am Main. 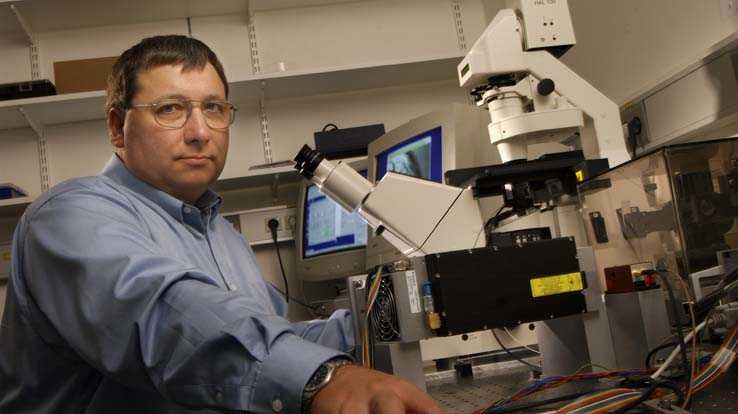 He started working on confocal fluorescence microscopy in 1983, developed 4Pi microscopy during 1990-1992 and worked on various orthogonal and multi-lens detection schemes (e.g. theta microscopy) since 1993. Recently, he invented and applied light sheet-based fluorescence microscopy (LSFM, SPIM, DSLM). Ernst Stelzer (co-)authored about 200 papers and three books. Several patents secure commercial instruments (e.g. the Carl Zeiss LSM series). Other contributions include the optical tweezers based Photonic Force Microscope (JPK, Berlin) and novel laser cutting devices. Apart from pursuing the development of LSFM along its various facets, his main interests in the modern life sciences are three-dimensional cell biology and biophysics as well as basic questions in developmental biology. Ernst Stelzer has developed calls for EU programs, contributed extensively to the development of Germany’s BMBF-funded Biophotonics and other related programs, is currently on an ERC panel and a reviewer for the ESF and many other funding agencies and journals. He has been on several national and international scientific advisory and review boards. Ernst Stelzer has been voted an EMBO member and is a recipient of the Ernst Abbe Lecture (awarded by the Royal Microscopical Society, UK) and the Heidelberg Molecular Life Sciences Price. He is a member of DPG, SPIE and OSA.